The flag of France varied from time to time and according to circumstances. At the time of Champlain merchant vessels carried a flag with a white cross on a blue ground. Such a flag is shown on Champlain's map of 1612. This flag, called the old ensign of France, was therefore that flown on the vessels of the trading companies of New France. Neither flags nor uniforms were so standardized as they are today. Vessels and troops often carried the colours of their commanders. But the flag of the royal navy and of the army in the early seventeenth century appears to have been like that of the merchant marine, with the difference that the ground was sprinkled with golden fleurs-de-lis, and the royal arms was placed on the centre of the cross. 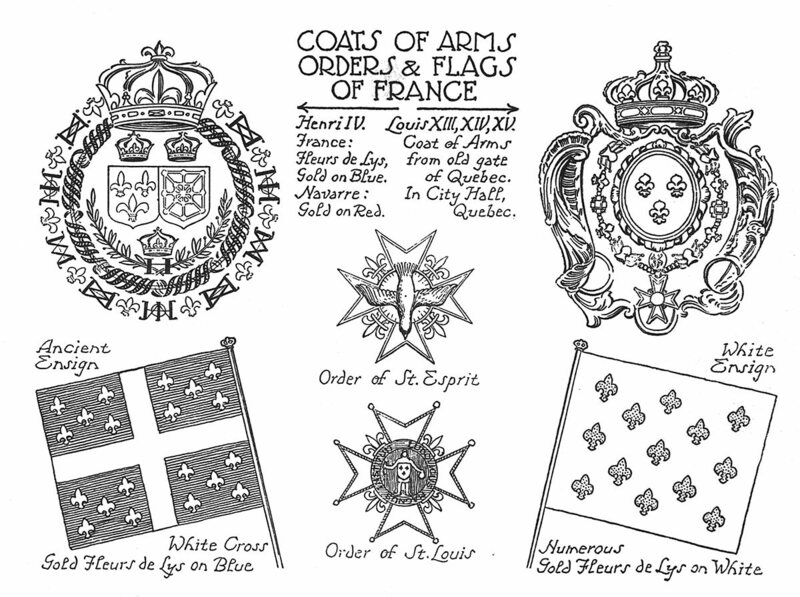 An edict of Louis XIV in 1661 ordered that the royal naval ensign should be white, with the arms of France in the centre. This is the first official order prescribing the use of white as a background. Later this became general throughout the nation, with the addition of the golden fleurs-de-lis. See Le drapeau francais au Canada, by Regis Roy, in Le Bulletin des Richerches Historiques, November, 1941. When Henri IV came to the throne of France in 1589 he already was King of Navarre, a small territory in the south-west of France, bordering on Spain. His title therefore was King of France and Navarre, and the royal arms consisted of the shields of both kingdoms. The title remained In use, but the arms of Navarre were discarded under Louis XIV. The circle surrounding the arms is composed of fleurs-de-lis alternating with monograms of the initial letters "H" and "M" of the names of Henry and his queen, Marie de Medici. The Order of Saint Esprit was founded by Henry III. It was the highest order of nobility, and was limited to a membership of one hundred Chevaliers. The cross bore a dove descending with outstretched wings: the symbol of the Holy Spirit. 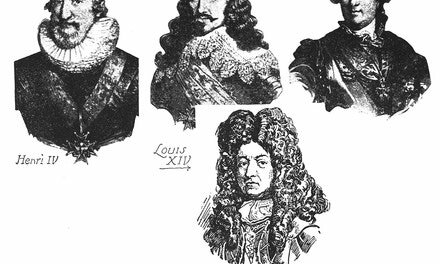 The Order of Saint Louis was founded by Louis XIV in 1693, and was conferred only for military or naval service. Those who received it must have distinguished themselves by some noteworthy action, or have served at least twenty-eight years as an officer. 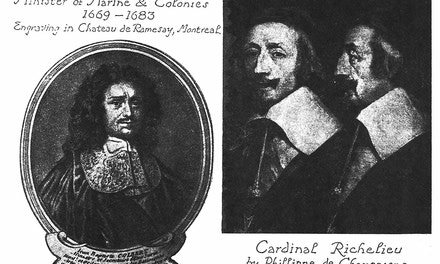 There were three grades in the Order: the most numerous class were the Chevaliers, above them were a smaller number of Commanders, while a few were awarded the Grand Cross, the highest rank. The recipient, kneeling before the King, or his representative, bareheaded and with his hands clasped, swore to live and die in the Catholic religion, to serve the King faithfully, to reveal all conspiracies against him or the state which might come to his knowledge, and promised not to leave his service for that of any other prince without his permission. The cross was of white enamel bordered with gold, and set with pearls and golden fleurs-de-lis, and was suspended from a flame-coloured ribbon. On the death of the wearer the cross was returned to the King.